Several months ago, I got my first adult cloth diapers (prefolds) from AdultClothDiaper.com and ChangingTimesDiaperCo.com. It was the first time I'd worn cloth diapers since my youth, and...well, they just didn't seem soft enough! My previous cloth diapers were the ones I'd worn as a baby, and had consequently been washed hundreds of times. Obviously, this wasn't a practical approach to softening my new diapers, but I still wanted crazy-soft diapers more than anything. So, I searched for easier ways to soften diapers. 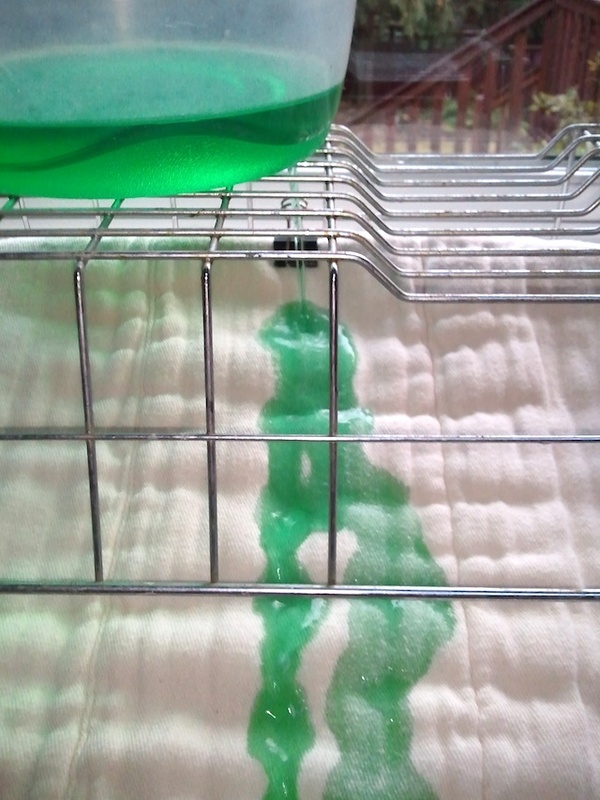 Fabric softeners seemed like the obvious answer, but conventional softeners have a tendency to reduce absorbency, and coat the diaper in a "repelling" layer, causing liquid to just roll of the fabric like oil on Teflon. However, testimonials from parents on several boards indicated that they had not noticed any such problems when employing eco-friendly "green" fabric softeners with their child's cloth diapers. Of the fabric softeners discussed, Ecover softener seemed to be the most highly recommended. I decided it was worth a try, bought some Ecover softener, washed my diapers with it, and oh my god - the diapers felt amazing! Just so, so good, I wanted to wear them all the time. They were soft, squishy...I just can't adequately describe how amazing softened cloth diapers feel. I hadn't spent much time in my new cloth diapers before trying softener on them, and I also tend not to wear wet diapers for long, so I would likely never have noticed any change in their performance had I not gone looking for it. Still, for those who wear cloth and have wondered, it seemed worth testing. 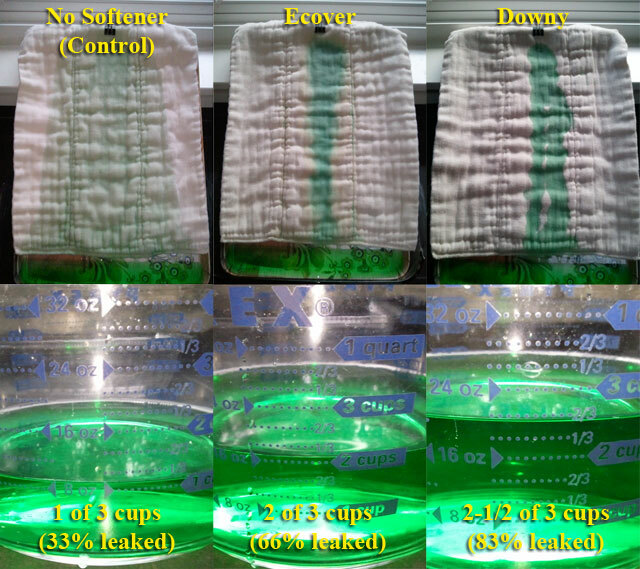 The aim of this experiment is to observe and roughly quantify the effects of fabric softeners on the absorbency of cloth diapers. I expect to see that fabric softeners do harm diaper performance, with the eco-friendly "green" softeners being less harmful than the conventional softeners. After all, mothers can't be wrong about Ecover…right? Subject diapers, both softened and non-softened, are placed on a flat surface that has been tilted to encourage runoff. A predetermined quantity of water is then slowly poured onto the "up" end of each diaper. Runoff is then measured, with lower measurements indicating better performance. 2) I then marked the corners of the diapers that were going to be softened so that I wouldn't confuse them. 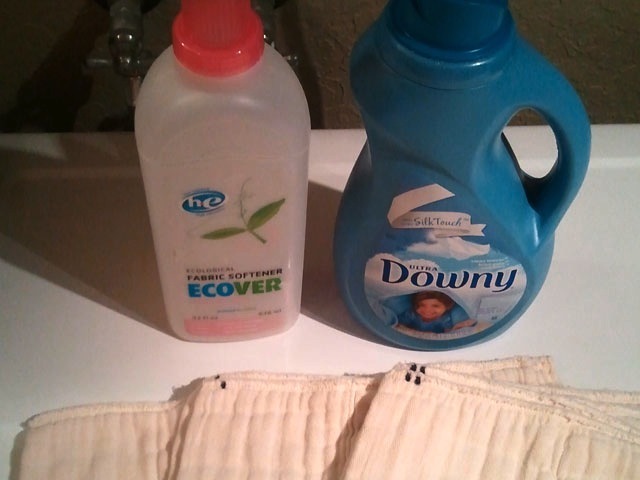 One hatch mark for the Ecover, two marks for Downy, a conventional softener. The unmarked diapers would be the "control" diapers, and would be tested without softener. 3) Next, each pair of diapers was run through a rinse cycle with the maximum possible volume of its respective softener, according to the directions on the bottle. This is certainly a worst-case scenario (normally, one would be washing more than two baby diapers! ), however I wanted to make sure that the effects of each particular softener on the diaper were clearly observed. 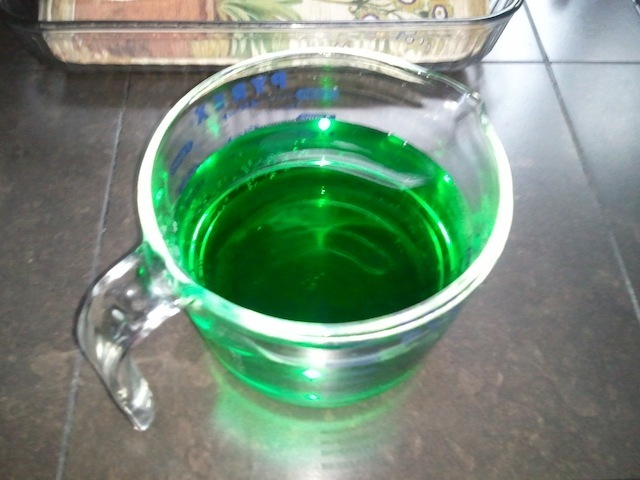 4) Three cups of green-dyed water would be used in each test - "fake pee". 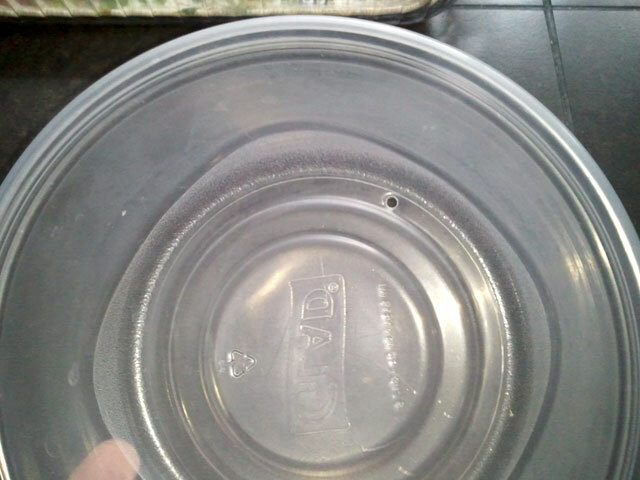 5) To ensure a nice, even flow of liquid onto the diapers, I sabotaged a thin plastic container by poking a 1/8" hole in the bottom with a screwdriver. 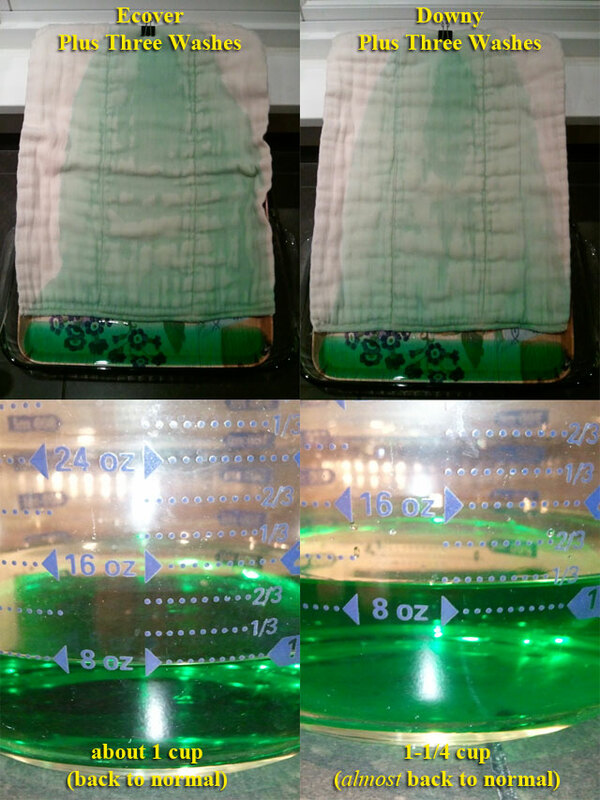 6) Each diaper was placed, in turn, into a large serving tray that was tilted approximately 20 degrees. 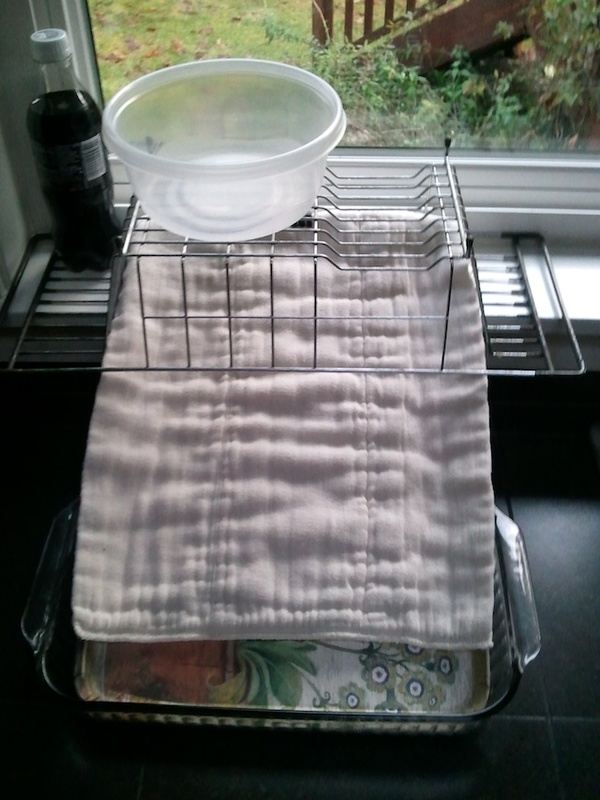 An overturned dish rack was placed over the "up" end of the tray to hold the reservoir of liquid. Note that in some of these pictures, it appears as though the rack is actually coming into contact with the diaper. That is not the case. 7) The liquid was poured into the reservoir and allowed to run onto each diaper (this is the Downy-softened diaper, and you can see how the liquid is rolling off). 8) Once the reservoir was empty, the diaper was removed and the liquid that had escaped into the bottom of the tray and the underlying pan was poured back into the measuring cup to see how much had run off. 9) The test was repeated for each diaper's twin to check for any anomalies in the process. The repeated tests produced almost identical results. Not surprisingly, the unsoftened diapers fared best, absorbing 2 of the 3 cups of liquid poured onto them. The Ecover-softened diapers fared worse than I had hoped, absorbing half as much as the unsoftened diapers. Finally, the Downy diapers absorbed only half as much as the Ecover diapers. 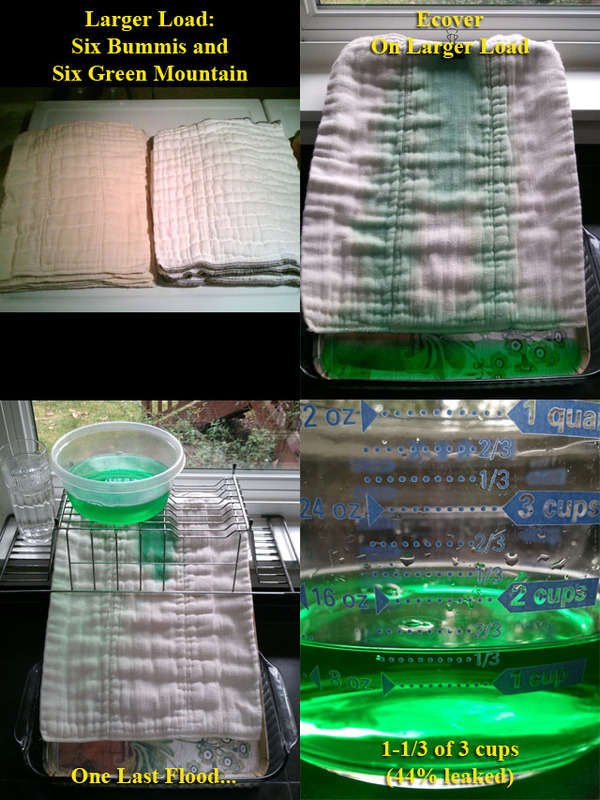 The dye appears darker on the softened diapers because the fabric didn't wick the liquid as effectively. In the real world, a load consisting of a mere two baby diapers would be ridiculous. Add to that a full dose of fabric softener and each diaper is quite literally bathed in softener! It's a worst-case scenario, at least intuitively. But how does it actually affect absorbency? Anecdotally, my own experiences washing several adult-size diapers with Ecover suggest that a greater diaper-to-softener ratio makes the diapers soft without absolutely destroying the absorbency. For this final test, I applied the same quantity of Ecover used in the first test to a load of one dozen diapers. These consisted of the original half-dozen Bummis prefolds (pre-washed to eliminate as much of the previously-applied softener as possible), and a half-dozen Green Mountain Diapers prefolds, which I'd recently purchased for stuffers, prepped, but never softened. Admittedly, involving a different brand of diaper poisons the test a little, but this is all about whether or not we see a change, and I didn't want to buy more diapers. 1) As demonstrated above, the effects of softener vary significantly. Applied in large quantities to very small loads, it clearly hurts absorbency a lot. On larger loads, however, one can reasonably expect to gain softness while retaining a majority of the diaper's original absorbency. 2) The effects of softener are easily undone, especially in the case of Ecover. Diapers no longer absorbent enough? 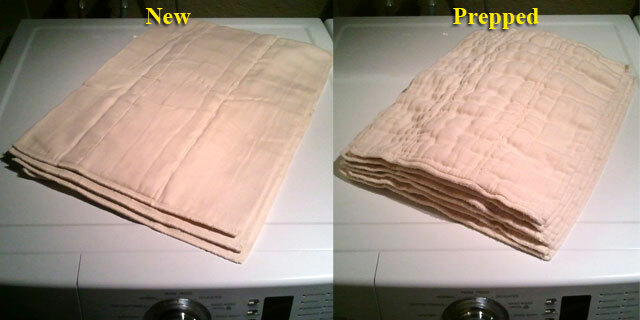 Restore their original absorbency with a few normal, no-softener wash cycles. 3) Softened diapers feel frickin' amazing. So what will I do? I will absolutely continue softening my diapers with Ecover. The feel is just too awesome to pass up, and when applied to my normal loads of 2-3 adult prefolds (equivalent to about a dozen toddler ones), Ecover has left enough absorbency to handle a couple of wettings. Further, if I ever needed maximum absorbency, I could either stuff my diapers or "unsoften" some of my diapers with a couple of back-to-back washes. Final verdict: Go forth and experiment fearlessly. There is no lasting harm in trying. I learned on the internet that mothers now days say not to use fabric softner all all.instead I leatned to use white vinegar in my final rinse.to pre rinse wet diapers first in cold water,then wash in hottest water with a good detergent an never use chlorine bleach,instead I use borateem as an additive,then 2 rinses in cold water with the final rinse adding like 1/2 cup of white vinegar ,then dry diapers.vinegar eliminates germs,residual detergent,odors,take place of fabric softners. My cloth diapers are flat rectangles, home made from different fabrics, I wash them with or without softener and could not find any big difference except that they feel better with softener, so usually I add some softener. I've tried the vinegar thing, and... :shrug: It doesn't really work. Not for me, anyway. Maybe if I had super hard water or something, and my diapers were getting calcified. Then, perhaps, the vinegar would help dissolve and displace the solids much like how descaling solutions remove calcium from coffee pots. But actively softening fabric is something else, really. You're coating the fibers. Compare a fabric softener like Ecover to what you get with vinegar, and there's no comparison in terms of softness. That's amazing Cottontail. I wonder what would happen if you used half the recommended amount of softener? Would the diapers be more absorbent and would they feel just as soft? You certainly did a lot of work on this experiment. I've noticed that a lot of the more resent cloth diapers seem a little less soft. Of course, they may last longer if the weave is tighter. Hey! Glad to be of entertainment. I've observed a few more things in the years since writing this post-turned-article, and they've influenced my routine a bit. I actually used to do more or less what you're suggesting. I'd add a bit (but not a lot) of softener to each load, with the aim of maintaining the softness of my diapers. What I found, though, was that after a few dozen back-to-back washes with softener, my once puckered- and quilted-looking twill diapers were starting to become smoother and flatter. I concluded that the softener was accumulating faster than the intervening wash cycles could deplete it. Rather than resume my search for the perfect quantity of softener (it might be mythical), I took what seemed like an easier approach and went to using softener only on every other rinse cycle. The hope was that, with two wash cycles (including detergent) between softenings, the balance would be tipped the other way. The downside would be that my diapers would alternate between being "very soft" and "a bit soft," but that seemed preferable to loosing my precious quilty twill. And that seems to work very well. I wonder what the effect of dryer sheets would be. The softening agent in most dryer sheets is lanolin, so I assume given a balanced load it'd be about the same. Which doesn't dissolve in water/pee, and instead coats the cotton. See where we're going here? Wow Cottontail, this was fantastic. I knew you had to have a science background and you do! Thanx for writing it. That's research done right! I don't document for all practical purposes ANYTHING, the bane of my existence. One thing about chemicals on or in your clothes, get a turkey baster and each time you get a new laundry product, put a tiny drop on the inside of your wrist and remember (or document) the result. That's the one patch of skin that would most often won't be affected by chafing clothes. Even if it's the same brand but a different scent or colour. EU regulations are tighter than the US ones and the chemical companies take full advantage. All they really have to state is "proprietary formula".